This slower paced DVD is specially designed to meet the needs of seniors. Feel the difference immediately! 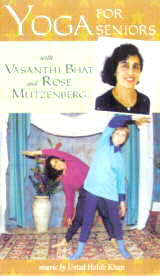 Make use of this DVD to improve blood circulation, feel energetic and strong, and to feel and look young. These postures are also effective for ailments like headaches, back pain, arthritis, insomnia, nervousness, stress, allergy and asthma.